Lavi’s Qtrac wireless communication system is the ideal technology for pleasant and effective crowd control. And it can be installed quickly - just plug it in and turn it on! Its self-contained architecture works independent from other networks you might have, keeping your proprietary information safe and secure. Qtrac CF call-forward electronic queuing systems, both for single line and multiple line situations, dramatically improve linear queuing to increase service efficiency, to decrease average wait times, and also add advertising and promotional opportunities into the queue while the customer waits. If your business uses a multi-line approach, the Lavi Qtrac CF Multi-Line system is ideal for the most complex arrangements. Streamline the way agents hail customers and make it faster and more efficient for all concerned. With a simple button-push on Qtrac’s wireless remote, agents instantly alert the next waiting customer via the LCD display and effortlessly guide them to an open service position using audio and visuals. Qtrac CF Multi-line automatically rotates through the lines, pulling customers in a fairly distributed manner. And since multiple open positions can be seen on screen at any given time, customers experience less confusion and frustration and know exactly where to go. Front-end Supervisors can even control line access during slow-traffic or high-traffic periods by opening and closing lines with a master wireless remote. Qtrac’s wireless communication enables fast and easy installation – just plug it in and turn it on! Please call U.S. Bank Supply at 805-218-6106 for more information about how the Lavi Qtrac systems can work for you. 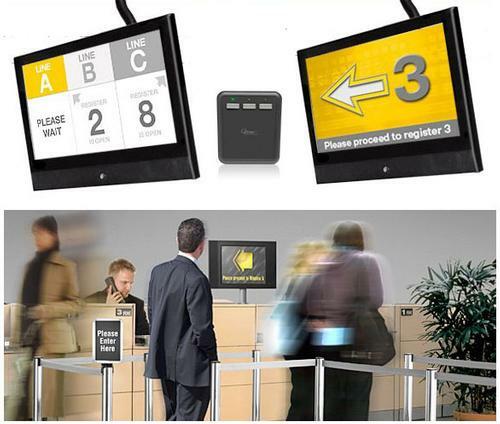 We will partner with you in the process of fitting this most advanced queuing system to your specific requirements. Lavi’s Qtrac wireless communication system is the ideal technology for pleasant and effective crowd control. And it can be installed quickly - just plug it in and turn it on! Its self-contained architecture works independent from other networks you might have, keeping your proprietary information safe and secure. QtracCF call-forward electronic queuing systems, both for single line and multiple line situations, dramatically improve linear queuing to increase service efficiency, to decrease average wait times, and also add advertising and promotional opportunities into the queue while the customer waits. If your businesses uses a multi-line approach, the Lavi Qtrac CF Multi-Line system is ideal for the most complex arrangements.